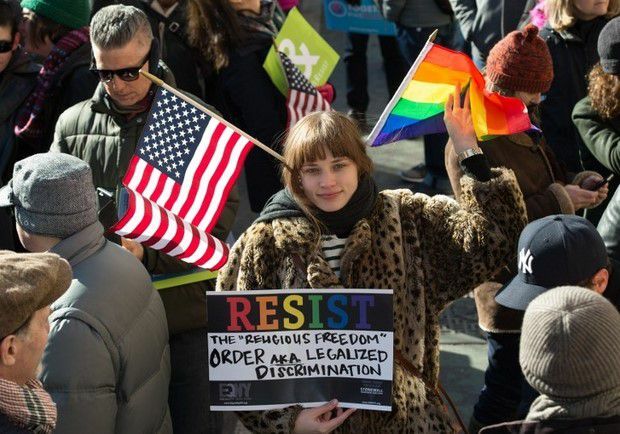 LGBT groups in the US have accused President Donald Trump of “concern trolling” over measures introduced to screen migrants for bigotry and negative attitudes to homosexuality which they say are intended to stoke discrimination against Muslims. Outrage over Trump’s “Protecting the nation from foreign terrorist entry” executive order issued on 27 January has largely focused on the banning of visa holders from seven Muslim-majority nations, which has been temporarily halted by a federal judge in Seattle. But the order also called for an overhaul of the screening process for migrants, and elsewhere stated that the United States would not allow entry to people who "engage in acts of bigotry or hatred or those who would oppress Americans of any race, gender, or sexual orientation".